DENVER (November 14, 2018) — RLH Corporation (NYSE:RLH) announced today the company has executed 34 mid and upscale Hotel franchise agreements in 2018. The Company’s Red Lion Hotel brand alone has 18 franchise agreements so far in 2018, growing the brand by over 62 percent to 47 full-service hotels nationally, with an average room count of over 200 and a robust pipeline. CHICAGO (Nov. 14, 2018) – More than 200 women from across the hotel industry gathered today to share knowledge and hear from successful, dynamic female executives at ForWard: Women Advancing Hospitality, an inaugural conference for industry women hosted by the American Hotel & Lodging Association. Canmore, Alta., The Malcolm Hotel and Event Centre, located in Spring Creek, the heart of Canmore, held its Grand Opening Gala on Saturday, November 3. It is the first four-star luxury hotel in Canmore and the first of three hotels being built in the Spring Creek community just off Main Street. The luxury hotel literally rolled out the red carpet for its black-tie guests, who were piped into the grand lobby where they experienced an unveiling of the new portrait of King Malcolm III of Scotland, a hotel tour that featured caviar, smoked salmon, scotch-tasting, champagne and an evening Ceilidh, with black tie and kits, tartans, Highland dancers, contortionists and the Johnny McCuaig Band. **Contact dHz Media for other high res photos from the Gala. The Canmore name originates from a town on the northwest shores of Scotland named after King Malcom III of Scotland who reigned from 1058 to 1093. Canmore is the anglicized version of “Ceann Mór” which is Gaelic for ‘Great Chief’ or ‘Head’ which was the King’s nickname. When designing the Malcolm Hotel, the developer wanted to pay homage to the town’s unique history and legacy. The four-star luxury hotel’s ambience and design reflects the royal decadence and heritage of past Scottish kings while encompassing an authentic, contemporary mountain feel. Spring Creek’s professional in-house design team collaborated with award-winning Marshall Tittemore Architects (MTA) to design the hotel while highlighting the surrounding natural beauty. MTA’s portfolio includes Banff Aspen Lodge and Sunshine Terraces at Sunshine Village. The Malcolm Hotel is located in Spring Creek, Canmore and bordered between two natural-flowing creeks and minutes from Main Street. Guests at The Malcolm Hotel enjoy convenient access to downtown Canmore’s eclectic collection of restaurants, cafés, pubs, artisan galleries and boutique shops. The hotel itself features 124 well-appointed rooms and suites, a fine-dining restaurant and lounge, and an 8,800-sq. ft. event space. It has 73 double queen rooms, 32 king rooms and 20 suites. Amenities include an elegant outdoor pool with panoramic views of the surrounding mountains from the second floor open-air mezzanine and fitness centre. In addition to the Malcolm Hotel, the Spring Creek community is situated on 70 acres and includes condominium homes, villas, estate home sites, Origin at Spring Creek – an active living senior residence and luxury mountain lodges with vacation suites. It recently launched its sixth mountain lodge and fourth residential project, the Jack Pine Lodge, named after the developer’s father, Jack Kernick. Developer Frank Kernick and his family have called Canmore home for three generations. Once a dairy farm and livery, the Spring Creek lands have been part of the Kernick family since 1927. In the 1950s, the family created Restwell, a popular campground, part of which operates today. The Malcolm Hotel was developed by Spring Creek, and is operated by Canmore specialist Clique Hospitality Management. Clique Hotels & Resorts was founded by Jim Muir, a Canmore resident and hotel consultant. It now operates five lodges in Canmore and two hotels in Calgary. Clique properties have all enjoyed number one rankings on TripAdvisor and continue to be the best performing hotels in the Canmore market. Tourism is a key economic driver in Alberta and the new hotel is already generating economic benefits as it meets the needs of an increasing number of tourists visiting the Canadian Rocky Mountains. The Malcolm Hotel is expected to staff more than 60 full-time and part-time employees, annually generating over $3.2 million in new salary and benefits. In addition to providing new job opportunities for locals the hotel will contribute to the number of tourism dollars spent in Canmore. According to the Canmore Business and Tourism’s 2015-2020 Strategic Plan, the 2020 target for the tourism sector is an annual visitor spend of $400 million (up from $278 million in 2012). Tourism in Alberta accounts for 54% of all visitors to Canada, taking in $8 billion annually while supporting over 19,000 businesses and employing more than 127,000 people. 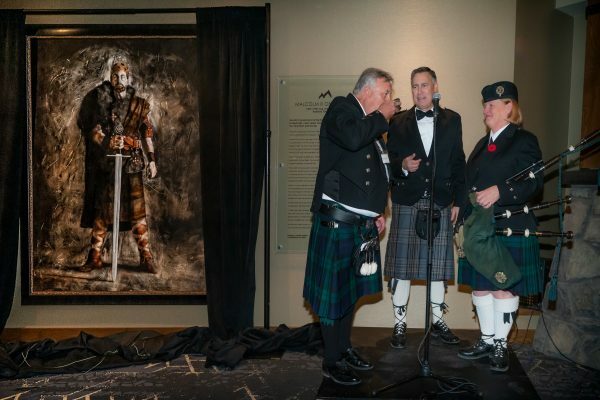 At the Grand Opening Gala, the Malcolm Hotel unveiled a large-scale portrait of King Malcolm III which it commissioned from Artist Charles Malinsky, who specializes in black and white figure representation. The portrait took five months to complete due to the research required to ensure the accuracy of clothing and weaponry. The Malcolm Hotel is now open and taking reservations for overnight stays, weddings and conferences. It currently has Book Early and Putting on the Polish promotions offering 20 and 30 per cent discounts when booking a stay. Interested parties should go to www.malcolmhotel.ca for more details. Online Media kit (background, fact sheet, photos) here.